Former presidents George H.W. Bush and George W. Bush won’t endorse Donald Trump for president according to their spokesmen Freddy Ford. Ford mentions, "President Bush does not plan to participate in or comment on the presidential campaign." During the GOP race, Trump often called for the release of 28 pages of 9/11 report, which were classified in order to protect the Bush family’s connections with Saudi Arabia. He also accused former President Dubya Bush for not preventing 9/11 and lying to the American people to support and invade Iraq in 2003. 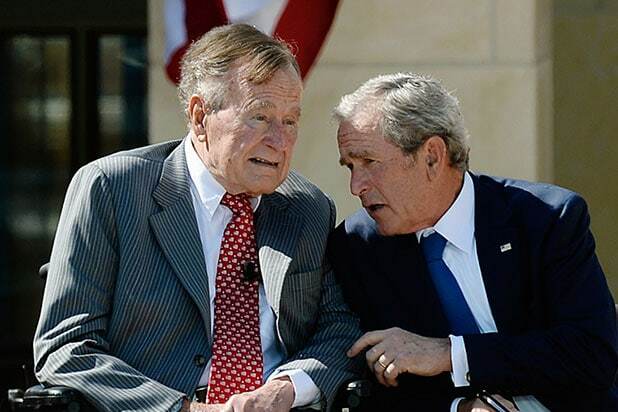 Will the Bush family even vote in the November general election, or will they stay home sour? Maybe they will vote for Hillary Clinton in spite. After all, both family's are relatively close. Bill Clinton is his "Brother from another mother"
At Nancy Reagan's funeral in March, the Bushes and the Clinton's seen hugging.